Well, what is Hungarian-style sauerkraut? It is a method (supposedly common in Hungary) of spicing the sauerkraut without killing too many of its valuable probiotics. As sauerkraut contains more healthy probiotics than yoghurt and is a very important source of vitamin C and B12, this is a desired outcome. The recipe is pretty simple. Take two cups of fresh sauerkraut. One you leave plain, the other you spice. For spicing heat (ad medium heat) the chosen cup of kraut in a pan with tomato paste. If you do not have tomato paste just make it yourself (per cup of sauerkraut fry half an onion in a pan with 100g tomato and add salt; after 7-10 minutes of frying turn it into a paste). Next, add 1.5 table spoons of medium hot chillie and 0.5 tea spoons of sweet chili (truly, authentically Hungarian would be to use just sweet chili). If the sauerkraut was prepared without caraway seeds, you may want to add now 1 tea spoon of caraway seeds. Heat and mix for 5 more minutes and add some water if needed. Next, let the kraut cool down a bit and mix it with the cup of untouched kraut. The sauerkraut is now ready to serve. Alongside serve some fresh yoghurt (the original Hungarian way is to serve it with sour cream I think). The yoghurt should serve your taste (I use low fat) and may be vegan if you want to. 2 cups is enough for 1-2 people. 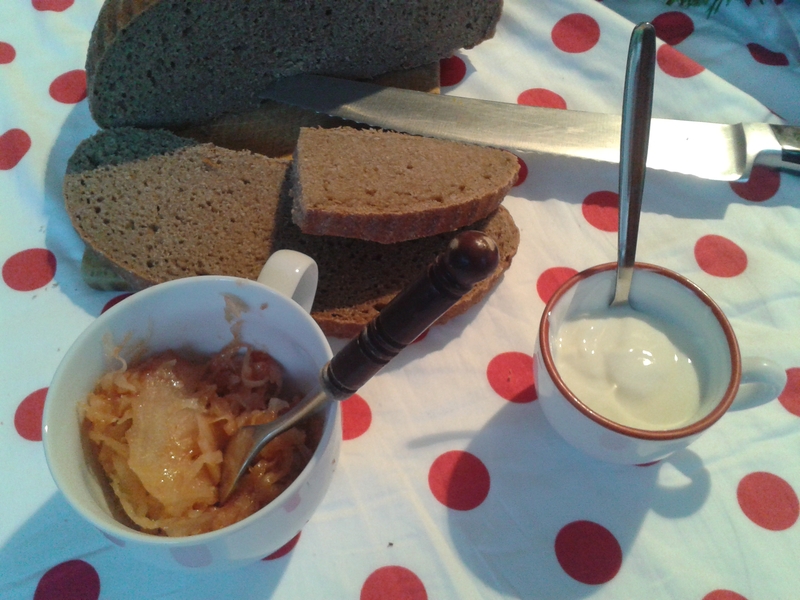 Allow everybody to mix yoghurt and kraut on their own plates. The mixture can be put onto black bread – it’s delicious!! !